ownCloud Mail is making rapid progress. We talked to some of its main contributors to get an idea of the why and how behind this app and of course – how to get involved! 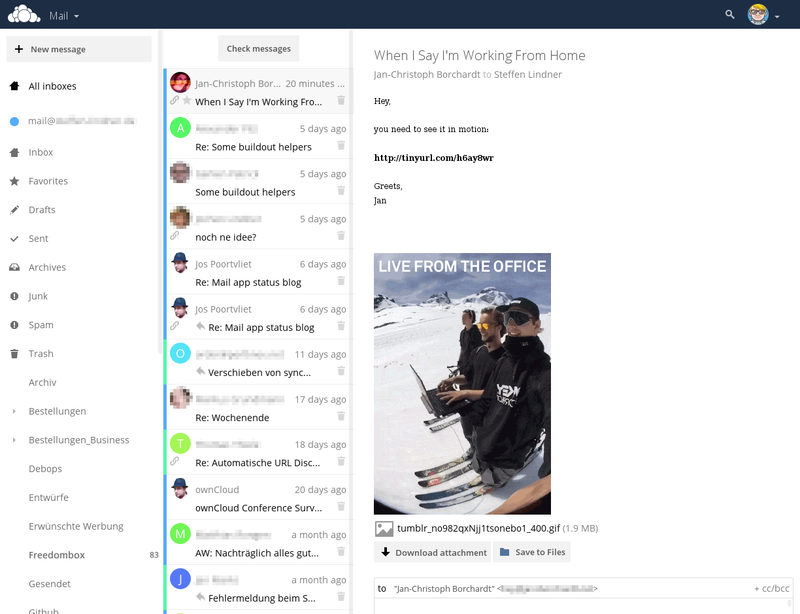 Asked about the goal of the ownCloud Mail app and why it matters, the contributors explain that the focus of ownCloud Mail is on integration. Jan explained that “Having Mail just makes sense for ownCloud as an important building block in the big picture of personal data. We already do files, calendar, contacts and more. Mail is another important part for many users”, summarizing the argument nicely. Christoph added that for him, “the primary goal is to have an easy to use, but also powerful web-based mail application”, “something that is tightly integrated into my ownCloud since I already have my files, contacts, calendar and news in it”. Another point is of course that by deeply integrating Mail in ownCloud, a more seamless experience can be created between the Calendar, Contacts, Mail and other apps. And Mail matters to many users. 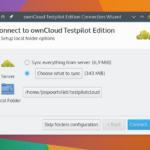 Steffen, hosting ownCloud at Port Knox, noted that it is the most requested feature there and for him, personally, he likes “to replace Thunderbird and wanna take ownCloud Mail with me”. While the coming 0.3 release is mostly a refactoring and bugfixing release (though Image Blocking is one new feature), some cool stuff is coming for 0.4 and 0.5. We asked the contributors for their favorites. Issues and PR’s are nicely tagged, so finding interesting things to work on should be easy. We also asked what would be nice to have but isn’t planned. 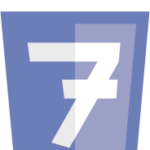 Christoph mentioned PHP 7 support would rock – it isn’t there yet. Jan asked for Undo for mail sending and Steffen threw in deep Calendar and Contacts integration and “feature parity with other mail apps”. That’s a big wish, but there’s plenty good stuff to get involved with so checkout the github issue list and get crackin’! Is OC Mail mobile friendly? Don’t worry. Answered by own question by installing it (yes, it is, although thin widths ). Overall first impressions, very nice! Love that it integrates with the browser through both notifications and registering as a mail client. Personally I’d prefer blank space to show than random coloured circles with letters in them for all of the senders who aren’t contacts (it just looks messy as is). I had some issues when I was setting up my mail, specifically I forgot to enter the outgoing server, and kept on getting an error message that authentication had failed. Was it my fault? Absolutely! ownCloud could have done a better job of hilighting where something was missing though, rather than just making it sound as if I’d entered an incorrect password (I hadn’t). The most common way of dealing with this would be to place red text next to the incorrect field saying something like “Required” or similar. It also wasn’t clear how to go back from reading an individual email to the list of emails in the thin width, mobile view (ie that you had to click X in the top right). I kept clicking on “Inbox” in the left sliding bar, which did nothing, where I expected it to go back to the list of emails. Alternatively, I was looking for a back arrow or similar in the top left corner, similar to what Android / iOS do, or for the hamburger menu button to show. Other than those minor issues, the layout is clean and works well. Love it! Tried with multiple mail accounts, which generally worked well and only one small issue (only the first set up account was choosable to send from when creating an email). Reading emails was perfect. It would be nice to be able to select the colour representing different email accounts in the settings dialogue. The second place I thought to try was by clicking on the coloured circle next to the account name. I don’t know how it does threading but a killer feature would how KMail does the threading. The actual tree like threading and not linear threading as does by Gmail or Fastmail. In times of increased awareness on privacy issues it would be nice to have PGP or better S/MIME encryption facilities. Some companies start to send and expect encrypted mail meanwhile so it would be nice to have it. have checkec owncloud mail for the first time. looks very good. but the reason for I look for is to find a solution to create autoreply messages. Are there any plans or activities to integrate it here? Would be brilliant. Hi. Trying to connect to my email server using TLS and it fails. Could be because I am using a self-signed certificate. Is there a way to tell the app that a self-signed cert is Ok? Hi. Having the same problem. Connecting to a self-hosted mail server without certificate works, but not to one having TLS and a self-signed certificate.